OneKind exists to end cruelty to Scotland’s animals. We expose cruelty and persecution through our investigations and research, and end it for good by giving Scotland’s animals a voice. Join us today and you will strengthen our voice. OneKind is Scotland’s leading animal campaigns charity. We are based in Edinburgh, with volunteers across Scotland and the UK, and our work covers Scotland’s wildlife, farm animals, pets and lab animals. The first step to ending cruelty is exposing it. OneKind uses a combination of investigations and research to uncover the evidence and puts the results in the public domain to show the public what’s happening. We’re an evidence-based organisation. Our campaigns and lobbying are based on a solid understanding of the scientific evidence and what our investigations tell us about what’s going on in the real world. You can access our reports, research and investigations in the Resources section of the website. Our campaigns make a big difference. They end cruelty for good. From stopping the unrestricted killing of Scotland’s seals to preventing hedgehog culls and ending the docking of dog’s tails, our successes speak for themselves. All of our campaigns are completely people-powered. They’re funded by individuals and it’s our campaigners who email, write, volunteer, and protest who make all the difference. We’re a small charity so we can’t cover every animal issue in the country (yet!). We select campaigns based on our ability to have an impact and the potential size of the impact. 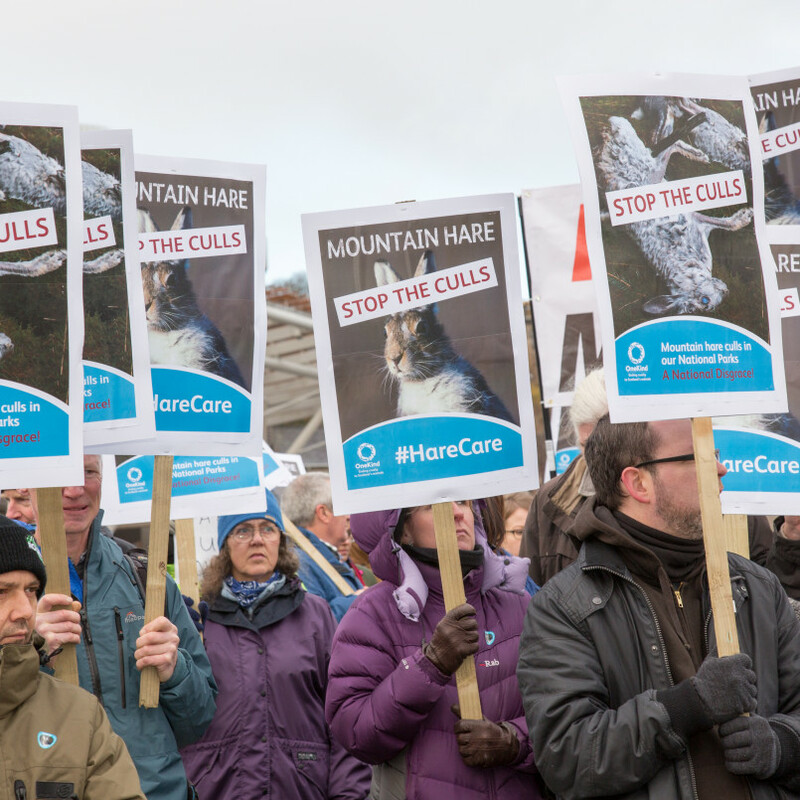 Our campaigns touch on wildlife, farm animal and pet animal issues as the powers to improve the lives of these animals are fully devolved to Scotland. Our work on laboratory animals is focused on public education as these powers remain reserved to Westminster. If you have an idea for a campaign, we’d love to hear from you. Just get in touch. To really end cruelty we need a big change in how people live their lives and, in particular, what we consume. OneKind embraces every act of compassion and encourages everyone to take the next step and be animal kind, whether that’s going vegetarian, vegan, or cutting your carbon footprint . Check out our www.onekindplanet.org website for more education and inspiration. We believe that people and animals aren’t that different. We all think, feel and love. And we’re all capable of suffering. Human kind, Animal kind…. We’re all OneKind in the end.